We’ve talked about it at length as it applies to the Major and Minor League systems of both the Phillies and the Flyers. Players break. Injuries are unfortunate but inevitable. Players get old, too, and/or leave for greener pastures. It becomes necessary to have young, quality players ready to step up and seize their opportunity on every level. If you don’t have them, ultimately every level fails. In the Phillies system, we have begun that “process” in earnest already this young season and we’re not even out of April. The IronPigs “golden arm” starting rotation–all members of the Phillies’ 40-man roster–have already taken some hits. It began with RHP Zach Eflin. Eflin started the season still recovering from bilateral knee surgeries, returned to the IronPigs rotation for one start before being summoned to take an MLB rotation spot for the now-60-day-DL Clay Buchholtz. RHP Ricardo Pinto, probably ticketed to get a few more AA spots early this season, started at AAA with the IronPigs and seized his spot here. Yesterday brought news of what is expected to be a short DL stint for RHP Aaron Nola. With continued tightness in his lower back and not a dreaded arm injury (or oblique for that matter) he may only miss one or two starts. The ever-solid RHP Nick Pivetta will start in his stead tomorow in Philadelphia against the Marlins. Pivetta was the most-stretched arm coming out of spring training; he was ready to go early, to pitch for Canada in the World Baseball Classic. He’s had only success this season with the IronPigs and has indeed been very solid. One note to make is that his starts have come on getaway days for the opposing team, where they may have been a little more free-swinging than the Marlins will be tomorrow. Pivetta will need to locate that 94-95mph fastball while continuing to throw his curve for strikes. Otherwise, he may give up some loud contact. Watch for emerging change and slider if he can get deeper into the game. I talked with Nick before the season. 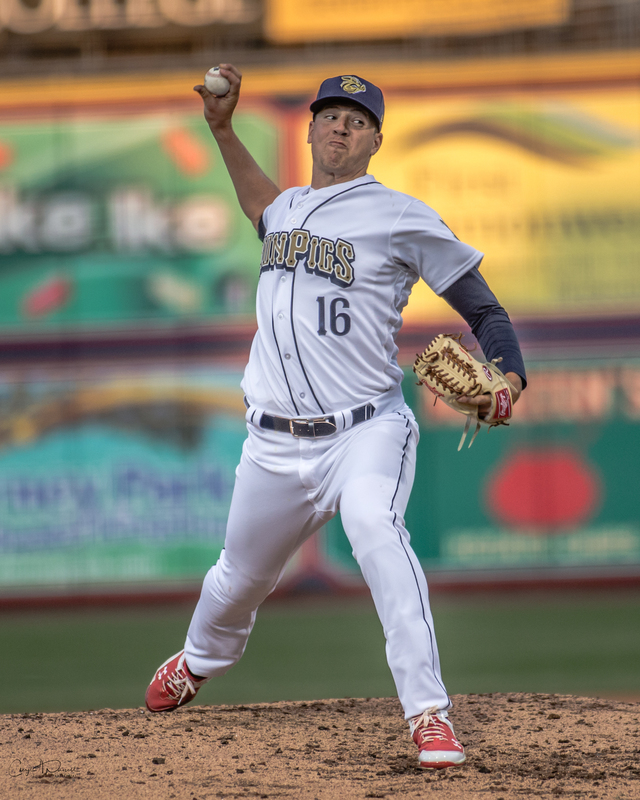 So while the Phillies are enjoying the fruits of their system depth–with Jake Thompson and Ben Lively still waiting in the wings and probably ready any time–the IronPigs are starting to run a little thin on starters at this early-season juncture. Let’s take a look at possible starting pitchers for the IronPigs rotation, going forward. Consider these guys 1a and 1b in the rotation, and ready when called-upon for the Phillies. Especially now that Jake ditched the goofy changes the Phillies tried to make in his delivery. However, should the opportunity present, one or both will find themselves in the Major League rotation. The other two guys in the IronPigs rotation are still getting things ironed out. Pinto, new to AAA, has had some success thus far, and I’ve been impressed. Listed at 6’0″/160lbs I’ll tell you he’s every bit of that and maybe more. It was hard to tell last season in Reading, but I stood next to him briefly earlier this season and he seemed to be bigger and “athletically” heavier than that–perhaps important for power and durability going forward as a starter. I still think he may be best suited for relief duties, but so far this season he’s proving me wrong and pumping FB 97 T99 on the wonky Coca Cola Park gun. His change-up is a “plus” pitch, as advertised. We’ll continue to watch if he can get deep into games consistently. All eyes are on Appel out of the stretch. It seemed to be a problem last season before his injuries. He was 95-97 with life out of the wind-up, but 90-91 out of the stretch–and getting hit hard there or just not hitting his spots, or both. While I saw a couple innings in the 222-showcase tune-up, I missed his first two starts on the road this season. During those starts he couldn’t get out of the fourth inning and gave up hits and walks. Last Saturday at Coca Cola Park his FB was sitting 90-91 both out of the windup and the stretch. Breaking pitches weren’t falling in for strikes exactly how he wanted them, but he wasn’t walking guys either. He gave up a bunch of weak contact early–seeing-eye ground balls and such. This and a homer lead to three early runs, but he settled in and was able to go 5 full innings, his longest start this season. We’ll continue to observe his fast-ball and his ability to deal with runners on base. Some folks are quick to consider moving him to a relief role, but getting that stretch-thing cleaned up, and now without the 97mph pitch, I’d say he needs to stay as a starter and grind through as a work in progress. Plus, with starters needed, there’s no reason not to. With the off-day yesterday, manager Dusty Wathan was confident using two starters for the double-header on Saturday. Recall the double-header was necessary because of the field debacle Friday night. But best-laid plans, eh? RHP Mark Leiter, Jr. Up with the Phillies now, sitting in the bull-pen, he’s been really strong in a long-relief role for the IronPigs this early season. He can throw every pitch and he can throw them for strikes. He’ll likely come back as Pivetta goes up tomorrow. However, if he’s used tonight by the big club–and I’d love to see him get an inning or two–he won’t be able to pitch tomorrow in Columbus. And that’s assuming he can get there and be ready, anyway. LHP Adam Morgan Right now, Morgan, Leiter, and Garcia are the guys Philadelphia can pull up and down to fill in relief roles as necessary, because they’re on the 40-man. Morgan, in getting sent down a couple weeks ago, seemed to say in an interview that he was still adjusting to how to prepare himself to be at his best when called-upon out of the bull-pen. If that’s the case, he’s got the opportunity to work on it here in AAA, but won’t if they move him back to a starting role. But, as the “long guy” he may be the guy tapped here. With an off-day next Monday as well, and with the possibility that Pivetta returns, it could be just a one-off deal. Or, it could be a true bull-pen game with someone like Colton Murray or Hoby Milner starting, followed by Morgan and then a Wander Perez or Pat Venditte depending on how the game is going. The Reading Guys: Reading isn’t exactly stacked with starters either, thanks to Pinto being with the IronPigs and LHP Elniery Garcia and his injury and suspension due to a fondness for horse steroids. There’s no one really knocking on the door to AAA. However, LHP Brandon Leibrandt has looked good early on, 2-0/1.69 in three starts. Eshelman, Viza, Watson and Anderson–in order of ascending ERA–still need more time at AA for sure.